The 12 Apostles (Ἀπόστολος, apostolos, Liddell & Scott, Strong's G652, someone sent forth/sent out) were men that, according to the Synoptic Gospels and Christian tradition, were chosen from among the disciples (students) of Jesus for a mission. According to the Bauer lexicon, Walter Bauer's Greek-English Lexicon of the NT: "...Judaism had an office known as apostle (שליח)". The Gospel of Mark states that Jesus Christ initially sent out these twelve in pairs (Mark 6:7-13, cf. Matthew 10:5-42,Luke 9:1-6), to towns in Galilee. James: commonly identified with James the Less  - Matthew's/Levi's brother, son of Alphaeus (Matthew 10:3; 27:56; Mark 2:14; 3:16, 18; 6:3; 15:40, 47; Luke 5:27; 6:14-15; 24:18; Acts 1:13; 4:36). It should also be noted that while the "Twelve Apostles" refer to the twelve who followed Jesus during his lifetime (and later Matthias in place of Judas Iscariot), Paul (formerly Saul of Tarsus) can be considered as another apostle. Notably, he begins many of his epistles with "Paul, an apostle of Christ Jesus", or some variant. The original twelve were apostles sent out to the Jews, whereas Paul has the unique role of being the apostle to the gentiles after Christ's resurrection and ascent. The individual that the Gospel of John names as Nathanael is traditionally identified as the same person that the Synoptic Gospels call Bartholomew, and most would agree that the sons of Zebedee is likely to be a reference to James the Great and John, while Judas (not Iscariot) probably refers to Thaddaeus, also known as St. Jude. Noticeably missing from the Gospel of John are James, son of Alphaeus, Matthew, and Simon the Canaanite/Zealot. James the Just was, according to Acts, the leader of the Jerusalem church, and Matthew is noticeably the most Jewish of the Gospels, and it may be the case that the author of John deliberately left out these two figures for a motive opposed to Jewish Christianity.[source? ]The second Simon may also have been Simeon of Jerusalem, the second leader of the Jerusalem church, after James. "Fisher's of Men." A Dictionary of Biblical Tradition in English Literature. David Lyle Jeffrey, general editor. Grand Rapids: W.B. Eerdmans, 1992. France, R.T. The Gospel Acording to Matthew: an Introduction and Commentary. Leicester: Inter-Varsity, 1985. 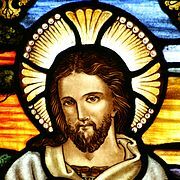 ↑ Catholic Encyclopedia: The Brethren of the Lord: "His identity with James the Less (Mark 15:40) and the Apostle James, the son of Alpheus (Matthew 10:3; Mark 3:18), although contested by many Protestant critics, may also be considered as certain." ↑ Catholic Encyclopedia: The Brethren of the Lord: "Some identify him [Symeon of Jerusalem] with the Apostle Simon the Cananean (Matthew 10:4; Mark 3:18) or the Zealot (Luke 6:15; Acts 1:13)." This page was last changed on 23 April 2019, at 20:30.